“Rates of intergenerational mobility vary widely across the US. This column investigates the effects of reducing differences in revenues and expenditures across school districts within each state on students’ intergenerational income mobility, using school finance reforms passed in 20 US states between 1986 and 2004. Equalisation has a large effect on mobility, especially for low-income students. The effect acts through a reduction in the gap in inputs and in college attendance between low-income and high-income districts. There are large differences in intergenerational income mobility across US states and local labour markets. The probability that a child born into a family in the bottom quintile of the national income distribution will reach the top quintile during adulthood is 14.3% in Utah, but only 7.3% in Tennessee (Chetty et al. 2014). better schools (as proxied by test scores; see Chetty et al. 2018). These patterns suggest that institutions and public policies have a role in promoting mobility. This cannot, though, be interpreted as a causal relationship. The first step to mitigating these differences and improving mobility is to nderstand the role of public policies. Recently I examined the causal role of school finance equalisation – a reduction in the differences in public school revenues and expenditures across school districts in a state – on the intergenerational mobility of students exposed to different types of funding plans while in school (Biasi 2019). US schools were historically funded mostly from local levies such as property taxes, and so wealthier districts (with a larger tax base) were able to spend more per pupil than poorer districts. A funding formula expresses each district’s revenues as a combination of state funds and local levies, and it allocates state aid to each district. In an attempt to equalise expenditure and guarantee equal opportunities to all children, over the past 40 years states have reformed their school finance schemes through changes to these funding formulas. In this interview, Jenny Schuetz talks about her research on housing supply. Specifically, she talks about the current state of housing supply in the U.S., how mechanisms of housing gains and losses vary across the country and how have they changed over time, explain why housing markets are prone to supply-demand imbalances, and more. Schuetz is a David M. Rubenstein Fellow in the Metropolitan Policy Program at the Brookings Institution. Hites Ahir: You have written a report on: The Goldilocks problem of housing supply: Too little, too much, or just right? What is the current state of housing supply in the U.S.? Jenny Schuetz: It’s important to recognize that the U.S. isn’t one integrated housing market – there are hundreds of metropolitan areas, each with different housing market dynamics. For policy purposes, it is helpful to identify which markets are balanced and which ones are unbalanced. One way to identify where housing markets are unbalanced is to look at the ratio between housing prices and incomes. In most of the U.S., median prices are between three- and four-times median household income, which is considered a healthy range. Metros with very high price-income ratios haven’t built enough housing to accommodate demand. Most West Coast metros fall into this category, plus East Coast metros like New York, Boston, and Washington DC. Metros with very low price-income ratios are mostly places that have experienced large population declines – older industrial cities around the Great Lakes, plus lots of smaller towns in the Heartland. The good news is that most metro areas have reasonably well-balanced housing markets. 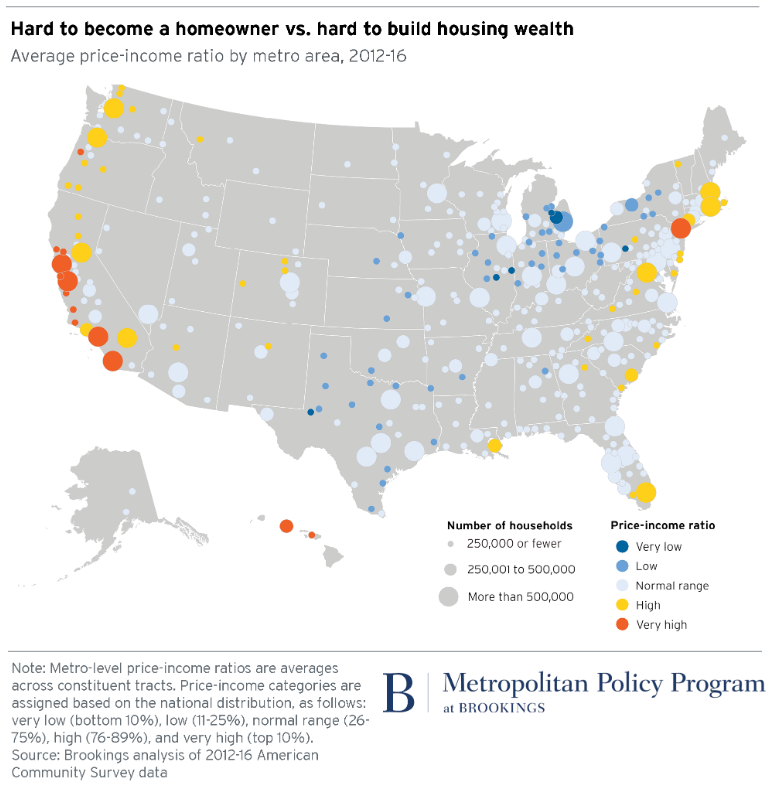 The bad news is that some of the largest, most productive metros – where lots of people want to live – haven’t built nearly enough, and so their housing costs are out of reach for middle-income workers. Hites Ahir: You have also looked at how mechanisms of housing gains and losses vary across the country and how have they changed over time. What did you find? Jenny Schuetz: For most of the 20th century, U.S. metro areas grew by building new single-family homes in suburban and exurban subdivisions. Even metros that lost population in the center city, housing supply expanded by building farther out. But since about the 1990s, the rate of housing growth has slowed – we are still adding housing, but not as much. And a larger share of housing growth comes through channels other than new construction: converting non-residential buildings into homes or reconfiguring existing homes into different types of units. How much housing growth comes through different channels varies quite a lot by geography, as the figure below shows. Hites Ahir: Why housing markets are prone to supply-demand imbalances? Jenny Schuetz: Housing markets have three unusual features. First, housing supply adjusts slowly over time. When a city loses population, the houses that exist don’t just disappear overnight. Building new houses in response to increased demand also takes time – months or even years, depending on the size and complexity of the project. Second, both housing supply and demand are tied to specific places. We can’t move empty houses from Detroit to meet demand in San Francisco. People can and do relocate, partly in response to housing affordability. But leaving jobs and social networks to move across the country is costly and disruptive. Third, unlike most other goods and services, all changes to housing supply must be approved by local governments. Building new houses, renovating or demolishing existing ones, requires explicit permission from local governments. If existing homeowners don’t want new homes built in their neighborhood, they will elect mayors and city councilors who enact policies that limit development. Hites Ahir: You have called for the need for better measures of housing supply. Can you tell us a bit about this? Jenny Schuetz: Understanding that housing doesn’t just grow via new construction, as the graph above shows, implies that we should be monitoring changes in housing supply through several different channels. But our best funded and most frequently used public data sources on housing aren’t well set up to do that. The decennial census and American Community Survey count housing units at a single point in time. The Census Bureau’s New Residential Construction Series monitors building permits, starts, and completions for new construction. It’s possible to use the American Housing Survey to break down housing supply changes into various components, but that’s technically quite complicated. 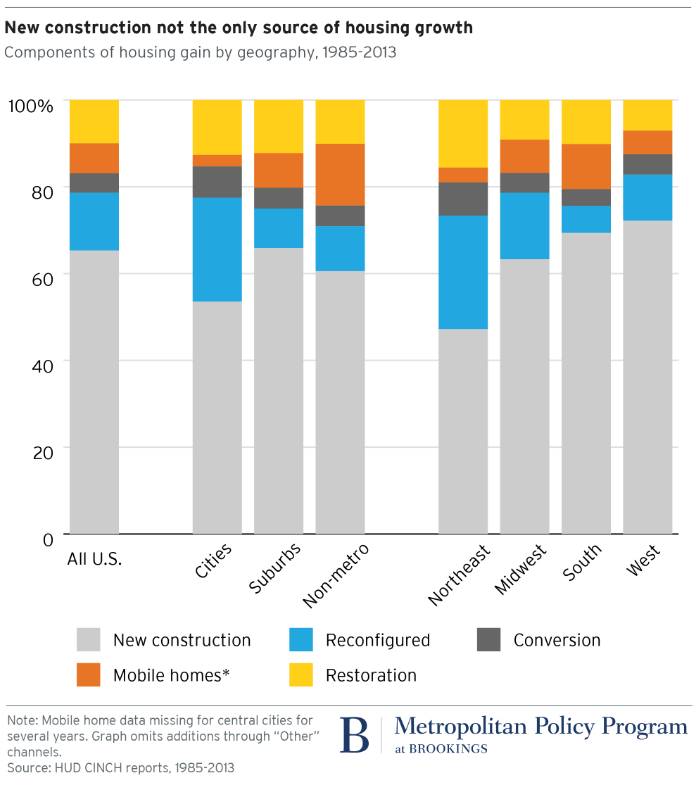 Housing researchers and policymakers would benefit from having more timely, geographically disaggregated data on the complex ways in which housing supply changes. Hites Ahir: You have also done interesting research related to neighborhood change. For example: Do art galleries stimulate redevelopment?, Bodegas or Bagel Shops? Neighborhood Differences in Retail and Household Services, Why are Walmart and Target Next-Door neighbors? How does this set of research ties with your work on housing supply? Jenny Schuetz: Within urban areas, most neighborhoods include both residential and commercial buildings, so it is helpful to think about the relationship between these real estate sectors. Better retail quality can boost neighborhood housing prices; and increased residential population or increased income of residents translates into more demand for neighborhood-serving stores and restaurants. Too often research focuses only on one side, but the interactions are fascinating. My art gallery paper was my first foray into the kinds of physical changes that buildings undergo, just looking at a very small scale like city blocks in Manhattan. Itis conceptually quite similar to my current research on redevelopment. Jenny Schuetz: My first job after college was at Abt Associates, consulting with local housing authorities about how to better manage their inventories of public housing. It was a great introduction to how different housing market conditions were in cities across the U.S. For instance, Boston’s housing authority had a three-year wait list for public housing – the private rental market was so expensive and so tight that people were willing to wait years for subsidized apartments. In contrast, St. Louis had 20 percent vacancy rates in public housing, because private apartments were fairly cheap and had better quality. In every city across the U.S., there are poor families who can’t afford housing. But it’s quite tricky to design policies, especially at the national level, that address affordability while being flexible to different local conditions. Hites Ahir: What does your day-to-day work at the Brookings Institution look like? Jenny Schuetz: I try to balance long-term research projects with shorter, topical pieces on current issues in housing/urban policy. This spring I have been analyzing new data on apartment zoning in California, while also keeping an eye on Oregon’s new rent control law and what the 2020 presidential candidates are – or aren’t – saying about housing. Hites Ahir: What is the most rewarding aspect of your job? Jenny Schuetz: My mission at Brookings is to explain to a broad public audience why housing and land use issues are important to people’s everyday lives. Academic papers are stylistically quite dry and technical, and mostly targeted towards other academics. At Brookings, I get to write about my favorite topics in plain English for a general audience, in the hopes of persuading voters to adopt better policies. It feels like a victory any time someone who isn’t a housing expert tells me that she’s learned something from my blogpost. In this interview, Jenny Schuetz talks about her research on housing supply. Specifically, she talks about the current state of housing supply in the U.S., how mechanisms of housing gains and losses vary across the country and how have they changed over time, explain why housing markets are prone to supply-demand imbalances, and more. 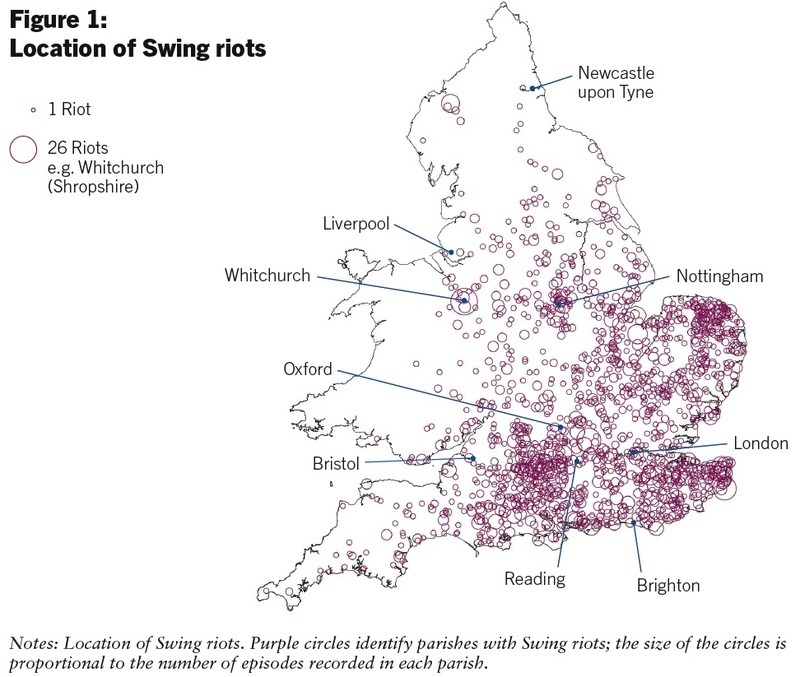 Schuetz is a David M.
“Here’s a figure showing locations of the Captain Swing riots. The authors [Bruno Caprettini and Joachim Voth (2018)] collect evidence about where threshing machines were being adopted based on newspaper advertisements for the sale of farms–which listed threshing machines at the farm as well as other property included with the sale. They show a correlation between the presence of more threshing machines and rioting. But as always, correlation doesn’t necessarily mean causation. For example, perhaps areas where local workers were already more rebellious and uncooperative were more likely to adopt threshing machines, and the riots that followed only show why local farmers didn’t want to deal with their local workers. “Between the summer of 1830 and the summer of 1832, riots swept through the English countryside. Over no more than two years, 3,000 riots broke out – by far the largest case of popular unrest in England since 1700. During the riots, rural laborers burned down farmhouses, expelled overseers of the poor and sent threatening letters to landlords and farmers signed by the mythical character known as Captain Swing. “The recent wave of growth in several developing economies has led to many analysts to claim that poorer countries are catching up with advanced economies. This column argues that, with the exception of a few countries in Asia which exhibited transformational growth, most of the economic achievements in developing economies have been the result of removing inefficiencies which are merely one-off level effects. While these effects are not unimportant and are necessary in the process of development, they do not imply ongoing economic growth. “The recent wave of growth in several developing economies has led to many analysts to claim that poorer countries are catching up with advanced economies. This column argues that, with the exception of a few countries in Asia which exhibited transformational growth, most of the economic achievements in developing economies have been the result of removing inefficiencies which are merely one-off level effects.